Goodbye ice cream, hello cupcakes! The ice cream man has some heavy competition this summer, as mobile cupcake bakeries begin to pop up on city streets all over the United States. Last June, New York welcomed a brand new twist on street food. 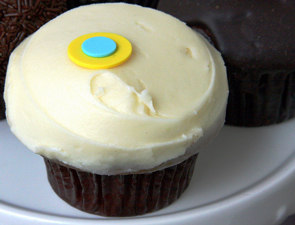 Claiming to be the first-ever cupcake truck in Manhattan, the Cupcake Stop has been so successful that it now has over five locations across the city and two retail outlets. Tiffany Kurtz says she quit her corporate gig and decided to convert an old mail truck into Flirty Cupcakes after she had the idea to upgrade the ice cream truck for urban dwellers. Each cupcake is individually packaged in tiny gift boxes, so you’ll really feel like you’re treating yourself to something special! Sprinkles, the haute cupcakery in Los Angeles, has recently launched its own version of the dessert truck. And Sprinkles is keeping up their posh Beverly Hills image in the 22-foot customized Mercedes-Benz Sprinter. The van holds up to 1,500 of the bakery’s standard flavors daily. Don’t worry if you aren’t within reach of one these cupcake trucks, because there are plenty of others hitting the streets of Miami, Washington D.C., Seattle, Philadelphia, Boston and San Francisco. Sometimes the best dishes are those that put a modern twist on traditional foods. We’ve collected a list of some of our favorite made-over classics. 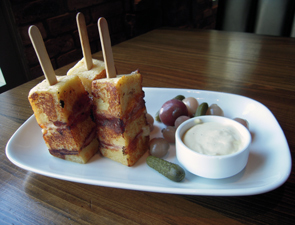 FIRST is overseen by Chef Sam Demarco, who brings flair to the ordinary with his own spin on popular dishes like croque monsieur pops, Philly cheesesteak dumplings and his NY Egg “Sam”wich served with tater tots, among other delights. Chef Sammy’s food is infused with creativity, making his dishes approachable, sophisticated and fun, all at the same time. It’s all about casual dining with a twist at Society Café. The menu has a creative flair that even includes a section called “Sticks, Picks & Finger Food” made expressly for sharing. That section, and others, is full of Chef Kim Canteenwalla’s spin on old favorites like “lollipop” chicken wings. Chef Kerry Simon breathes new life into the desserts on his menu. He turns classic junk food like Hostess Cupcakes, Rice Krispy Treats and chocolate caramel popcorn into top notch desserts. These simple, yet unique treats will surely make you feel like a kid again. This week, July 26-August 1, the European Union and Wines of Germany is sponsoring the sixth annual “Riesling Week,” a celebration of the diverse Rieslings from Germany, Austria and Alsace. Restaurants in New York, San Francisco, Las Vegas, Chicago and Miami will give diners the chance to sample a wide range of styles of European Riesling by the glass, by the bottle or with a special pairing menu. Wine shops will also host European Riesling tastings throughout the week. MICHAEL MINA Bellagio is featuring a flight of 4 Rieslings for $34. 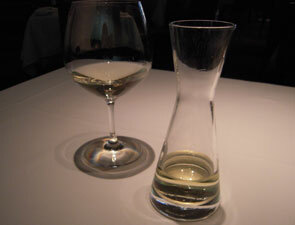 Aureole is offering a German and Austrian Riesling flight for $14. AMERICAN FISH is offering a flight of 3 Rieslings for $16. In honor of national crème brulee day we thought we’d give you a little information about the delectable dessert and where to try it in honor of this special day. The earliest known reference to the dessert is in François Massialot’s 1691 cookbook, but nearly half a century later the French name was changed to “crème anglaise.” The English, French and Spanish all take credit for the silky dessert and have a variety of names for it such as “crema catalane,” “burnt cream” and the ever popular “crème brulee.” Perhaps the most popular modern reference to crème brulee is in relation to its history with Le Cirque. Credited with, but refusing to take credit for, the creation of Creme Brulee, Sirio Maccioni is a legendary restaurateur. He, his wife Egidiana, a legendary cook in her own right, and sons Mario, Marco and Mauro preside over the nightly culinary scene at Le Cirque where New York society has dined since 1974. But if you can’t celebrate National Crème Brulee day with “Crème Brulee Le Cirque” in New York City today - how about placing your bets on Crème Brulee - three ways - in Las Vegas at CityCenter’s ARIA Resort & Casino? Sage, Julian Serrano and Sirio Ristorante each offer their own rendition of the creamy dessert (or appetizer) whose origins are in as much hot contention as the salamander used to create the caramel topping! 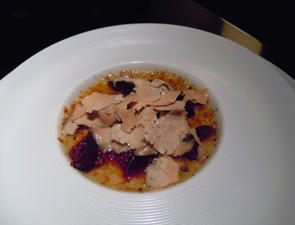 Sage delivers a combination of sweet and savory with its immensely popular Foie Gras Custard Brulee. Chef Shawn McClain infuses the custard with fresh foie gras and tops the dish with cocoa nibs, moro blood orange and salted brioche. At Julian Serrano, Chef’s Crema Catalan is a tribute to Spain, which he believes is the true creator of the famous dessert. Julian Serrano’s Spanish version is served cold with a crisp, sugary ceiling and a touch of pineapple ice cream. If you simply must have the Le Cirque connection, Sirio Ristorante’s Crema alla Catalana features a vanilla-infused custard garnished with fresh seasonal fruit, and an intoxicating vanilla aroma. When the early settlers came to the United States, the Native Americans taught them how to grown corn, pound corn into meal and how to cook with it. Since then, corn has grown to be the largest crop in the United States, in terms of acres planted. Not to mention, corn is the key ingredient in many great American meals such as corn chowder, creamed corn, cornbread and the timeless corn on the cob. Corn, also known as maize, is a cereal grass that has been cultivated for over 10,000 years. Corn is an annual crop that must be replanted each year and is grown all over the world. Are there different kinds of corn? Sweet corn is typically grown for consumption and comes in white, yellow and extra sweet varieties. Field corn, which comes in white and yellow varieties, is typically grown for livestock feed and for making cornmeal. The third variety of corn, ornamental, is usually grown is usually used as decorations during the fall. Where can I buy the freshest corn? Corn is at its peak in late summer. Although corn is available year-round, you can typically find locally grown varieties at farmer’s markets during the summer. Local corn not only tastes better, but also tends to be less expensive. The sugar in corn begins to convert to starch as soon as it is picked, which reduces its natural sweetness. For this reason, corn is best the sooner it is served after being picked. 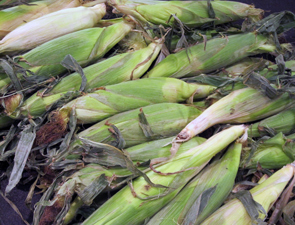 At the market, choose sweet corn that has bright green, moist husks and silk that is stiff, dark and moist. If you press gently on the husk, you should be able to feel the kernels. How should I store corn? Before cooking, keep corn moist and cool. For maximum freshness, store corn in a freezer bag or cooler on the way home from the market and then refrigerate immediately. If you do not plan to use corn immediately or has are buying from the grocery store, add a bit of sugar to your recipe. Always try to use corn within two to three days. How should I cook corn? Corn can be cooked a variety of ways and makes a great complement to many dishes. However, good ole’ fashion corn on the cob is typically boiled or grilled. Boil: In a pot large enough to submerge corn, bring water to a boil. Add husked corn ears and continue to cook on high heat for three to four minutes or until kernels are piping hot. Grill: To grill corn, peel away the husk and silk, drizzle with olive oil and place the corn directly on the grill over medium heat. Occasionally rotate the corn to prevent excessive charring. The corn should be ready in about 10 minutes. After grilling, season with salt and paper and a bit of butter for a vegetable that anyone will eat. A chef’s kitchen likely differs from our own in some obvious ways, but most of us can probably imagine what might be inside of a top notch kitchen. Their appliances are bigger and better, plus they must have some ingredients and tools a bit off of the beaten path. To feed our curiosity, we asked a few of our favorite chefs what the most unusual item in their kitchen is and compiled a very unique list. “There’s a pig’s head in my walk-in right now,” Chef Dustin Lewandowski answered, straight faced, then laughed. “That’s kind of unusual to some.” Just what does Chef Lewandowski use a giant pig’s head for? He makes his own head cheese, Fromage de Tete. The pig’s head is rinsed, soaked and then brined and slow cooked until all the meat falls off. “Then we pull it and make a terrine out of it,” he says. Chef Barry Dakake’s has a top-of-the-line kitchen, but his favorite thing? The door to his office. And that door happens to be a pretty special door. “It started two years ago,” Chef Dakake explained. “Carmelo Anthony, a basketball player for the Denver Nuggets, used to eat here all the time. I’m a big sports fan, so I used to tell him, ‘When are you bringing me my basketball? You’re always shaking me down — I want a basketball jersey or something.’ So one day Carmelo said, ‘Let’s go in the back; come on.’ So he’s walking in my kitchen and says, ‘Take me to your office,’ then, ‘Give me a marker.’ And he signs my door — the people’s champ.” Since Anthony left his John Hancock on his door, Chef Dakake has invited a host of celebrity guests to do the same. Among those who’ve signed his door, for instance, are Joe Montana, Dan Marino, Gary Sheffield, Johnny Bench, Ernie Banks, Jerry West, President Bill Clinton and Derek Jeter. Why garnish a cocktail with fresh fruit when you can have exquisite jewelry adorning your drink? Some mixologists around the country are dressing up the average cocktail with silver, diamonds and pearls. While the jewels won’t add to the taste, it will certainly add to the sparkle. And even though your drink won’t last long, you’ll walk away with a beautiful new addition to your jewelry collection that is sure to last a lifetime-and just might justify that hefty price tag. This extra-special martini is served by a white-gloved waiter in a crystal glass sitting atop a silver platter-and that’s not all. The cocktail also features one very special rock. At the bottom of the drink, sits a 1.5 carat diamond from the hotel’s jeweler. If you want to treat your lady to this special cocktail, be sure to make arrangements at least three days in advance. At $1,000 a pop, these drinks truly are just for high rollers. Both of these martinis come with a fine piece of Lagos jewelry. The Gotham Martini is paired with a strand of pearls, while the High Roller comes with a shiny diamond ring. An added bonus, for each cocktail sold, the restaurant donates $500 to Share Our Strength, a charity battling worldwide hunger. 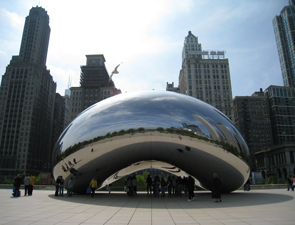 Peter de Castro created the Cloudgate after being inspired by Millennium Park’s infamous bean in downtown Chicago. The martini is a mixture of Grey Goose La Poire, homemade sour mix, pineapple juice and a splash of champagne. The drink is then draped with a sterling silver Elsa Peretti bean necklace. If you feel like you’ve frequented the same restaurant one too many times, it might be time to check out an underground supper club in your area. You may ask, what exactly is that? An underground supper club is essentially a dinner party that occurs between strangers in a mystery location-usually headed by some of the city’s top chefs. This unique trend is growing in popularity and is becoming somewhat of a “have to” for foodies in cities like Chicago. Chef Iliana Regan of One Sister Inc, created a supper club that has quickly turned into one of the Windy City’s most talked about summer hot spots. At her home in Chicago’s north side, Regan’s communal dinner table can accommodate up to 10 guests and it is always full, so be prepared to share your dining experience with a few strangers. After personally greeting her guests at the door, diners mingle while Regan retreats to the kitchen to finish cooking the elaborate 12-course meal. Having worked at Alinea and Trio, Regan’s experience in the kitchen is impressive. She serves up unique dishes made with local ingredients, including some from her very own garden. Although her menu changes often, a recent menu included octopus, foie gras and honeydew sorbet. Regan says her dinner parties are temporary, as she plans to open a restaurant called Mermaid Café in the near future. For now guests can reserve their spot at her private table by calling 773-598-0602 or e-mailing onesisterinc@gmail.com. A $90 donation, plus tip, is suggested. The tomato is the world’s most popular fruit and many flock to farmer’s markets around the country to find the freshest, ripest tomatoes. Here are some tips to pick the best of these summer gems. Although tomatoes are commonly referred to as vegetables, they are actually fruit. It is a member of the nightshade family and a cousin of the eggplant, pepper, potato and tomatillo. Tomatoes were once called “wolf peaches,” because, in the early days, they were erroneously considered to be poisonous. Are there different kinds of tomatoes? Tomatoes come in a variety of sizes, colors and textures. In fact, there are countless different kinds of tomatoes available worldwide. Some of the most popular include currant tomatoes, cherry tomatoes, plum tomatoes and slicing tomatoes. Red and yellow currant tomatoes are best eaten right off the vine or used as a garnish. Cherry tomatoes are typically eaten raw and are often used in salads and salsas. Plum tomatoes tend to be grilled or used in sauces, soups, stews, jams, and chutneys. Slicing tomatoes, which include the beefsteak and the oxheart tomatoes, are ideal for slicing fresh, but can also be used in salsas, sauces and soups. Where can I buy the freshest tomatoes? The best tomatoes are dry-farmed, meaning the tomato plants aren’t watered after their flowers bloom. This leads to a better, deeper flavor. Once the tomato plant produces fruit, the most experienced farmers will allow the fruit to ripen on the vine before picking any. As a result, the tomato is a very delicate fruit and consumers can find the freshest tomatoes at farmer’s markets, when they are sure that the plant has been grown locally. When shopping for tomatoes, choose the ones that are heavy and have an earthy smell. How should I store tomatoes? The tomato is a delicate fruit that needs to be handled gently. 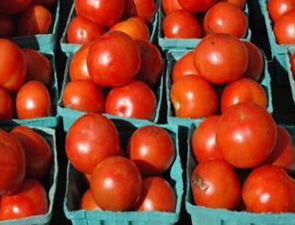 Tomatoes shouldn’t be crammed into one bag, as they are heavy and can bruise each other. Always hand pick tomatoes at the store, wash and store at room temperature. Tomatoes should never be stored in the refrigerator-temperatures under 50 degrees Fahrenheit will make tomatoes wrinkled and mushy much more quickly. July is national hot dog month and, although a Chicago-style hot dog is not your average dog, no city is more famous for their hot dogs than Chicago is. So what exactly is a Chicago dog? By most accounts, the Chicago dog originated during the Great Depression when the owner of a vegetable cart created the “Depression Sandwich,” a hot dog topped with a variety of vegetables that was sold for a nickel. 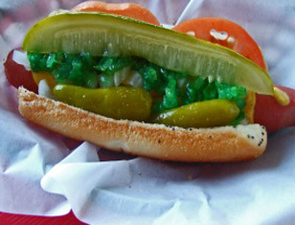 The “sandwich” caught on and the Chicago-style hot dog was born. Today’s dog features an all beef hot dog that is steamed-never boiled-in a poppy seed bun and topped with yellow mustard, sweet pickle relish, chopped onions, two tomato wedges, a pickle spear, two sport peppers and a sprinkle of celery salt. And, yes, the order in which the ingredients are placed does matter. A perfectly assembled Chicago-style hot dog ensures that the diner will taste each ingredient in every bite. With over 1,800 hot dog stands in the city of Chicago, the hot dog is, arguably, the Windy City’s most famous signature food. So, next time you’re in town, indulge yourself at one of these local favorites. Just remember-a Chicago dog will never come with ketchup! With a selection of up to 18 different sausages, Hot Doug’s offers more than just a typical Chicago hot dog stand. In addition to the Chicago dog, options may include rabbit, boar, pheasant, duck and even kangaroo. Hot Doug’s also offers a variety of mustards, tomatillo, caramelized onions, chili and cheese. Superdawg is a throwback to the old 50s drive ins. In fact, diners order from their car and their Chicago dogs are brought right to their window by a traditional car-hop.